Let A-Team Removals manage your house move and arrange everything for you. 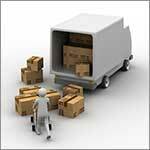 Our team will carefully pack and unpack your belongings and deliver them safely. This will take a lot of the pressure off of your already busy and stressful time and leave you to enjoy moving into your new home. Our nationwide coverage means that A-Team Removals can relocate your office anywhere within the UK. We will ensure that your office furniture, filing cabinets and equipment arrive safely and on time at your new location. Piano Moves require specialist knowledge. Pianos are very susceptible to damage and should be handled with care. We have expert knowledge to move your piano safely to its new home. Stairwalkers and other specialised handling equipment, ensure your goods are moved safely to thier new home. Even with those difficult to get to situations, our expert team have the knowledge and experience to get the job done. Looking after your valuables. We are or course, fully insured, so why risk moving your valuable items and furniture yourself, when we will do this for you safely and at a very competitive rate.